Mr. Doran Smout was a dedicated solar cooking supporter in many ways. Doran first got into solar cooking by constructing solar cookers with his dad, and his brother Joseph. He went on to lead many solar cooking events in his neighborhood. 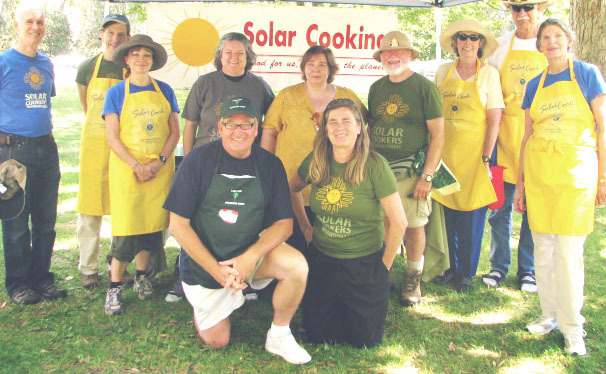 Doran often volunteered with Solar Cookers International, doing solar cooker demonstrations such as at the CA State Fair. Joseph described Doran as a “really great guy, very tender hearted.” Joseph said, Doran “was quite proud of Solar Cookers International." SCI will continue to honor Doran’s memory, carry on his values, and spread his dedication to solar cooking, thanks to a very kind bequest that Doran made. SCI and all of the people who benefit from solar cooking thank Mr. Doran Smout for his dedication, foresight, and generosity. Mr. Doran Smout (fourth from right, wearing a green shirt and the khaki hat) at a solar cooking demonstration.